We get our kids to try new vegetables by taking them to the Farmers Market and encourage them to try one new vegetable they have never tried before. The kids got turnips and radish this week when we went to the Fayetteville Farmers Market. We hope that getting them to try one new veggie it will lead to a healthier diet later in their adult life. With Halloween in the air and the harvesting of pumpkins abound. 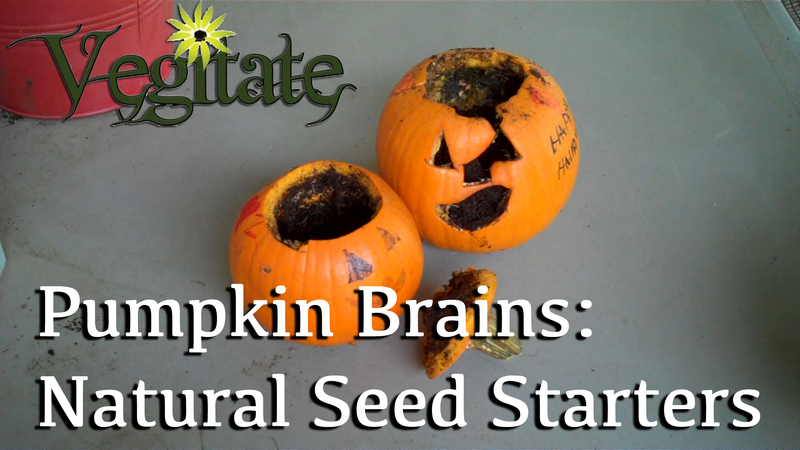 Vegitate decide to show our fellow gardeners a unique idea on how to germinate seeds with old pumpkins as a seed starting medium. When you are carving your Halloween pumpkin leave a few seeds inside. After a week throw in some dirt and a little water inside. The seed will germinate and form a new life. Plant the entire jack-o-lantern in the ground and the life cycle of the pumpkin will a start again. This a great fall actively to do with the kids in the garden and great way to recycle your jack-o-lantern. Fact of the day: Pumpkins are known as the winter squash, and grown primarily in North America and UK.